Farm Simulator as the name suggests, is specifically designed for people who love simulations games and want to do virtual farming. No wonder farming is a world full of wonders for most people and that’s why Farm Simulator has millions of users all over the globe. Of course, most of those people haven’t seen or done real farming by themselves but they can fulfill their fantasy using this game which is available for all major mobile operating systems including iOS and Android. The game is compatible with all iOS devices running iOS 7 or higher and all Android devices running Android 4.2 and above. One of the best things about Farm Simulator is its realistic graphics and gameplay. It mimics all the activities and tasks done in real farming and livestock management. You can harvest different kind of crops based on how much land you have. You can also manage your live stock like cows, pigs, chickens, sheep and other animals. The products produced by the harvesting and livestock are sold in the market. Farm Simulator has more than 50 different farming vehicles and heavy machinery and interestingly these are branded machines made by some top industry names like Challenger and Massey Ferguson. You can harvest crops like potatoes, corn, canola, wheat, rice, sun flower and many others. According to some industry experts, Farm Simulator is one of the most complete farming simulation games ever made for any platform including phone and desktop. Following are some key features of Farm Simulator. The game has amazing graphics and highly realistic farming machines made by top companies of the industry. You can choose the crop of your choice to harvest and meanwhile breed farm animals like pigs, chickens, sheep and cows. You can sell the milk and wool of your animals to increase profitability and keep a close eye on the expenses to make your business more efficient. Farm Simulator comes with multiplayer feature where you can play the game on a local network via Wi-Fi. The game is available for $5 on iTunes and all the features are unlocked that means there are no IAPs and this $5 price tag is a onetime payment. When you start the game for the first time, you get a farm with some fields but you can expand it later to grow your business. 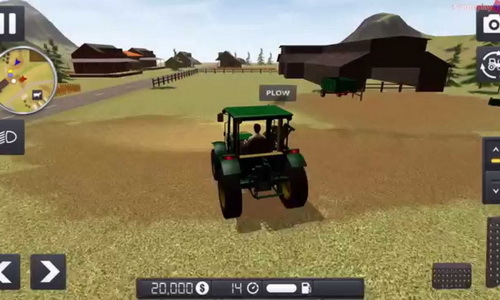 Unlike many other simulation games, Farm Simulator is specifically designed to make it easier for new users. You can learn the game in few minutes, however mastering it an entirely different story.